On June 27th (Friday), the report "Breaking the Climate Deadlock" prepared by the team that Mr. Tony Blair represents, was presented in Tokyo. Mr. Blair is the first person who put "climate change" in agenda at G8 summit, and also has launched "Gleneagles Process" to tackle this problem. As a leader of the world he continues worldwide lively activities even after retiring from his post as a Prime Minister. I have written about it before, and his purpose this time, I assume, is to announce the results of these activities and to promote them in the G8 summit. On June 28th and 29th, GLOBE International, an activity of legislators of the states in G8+5 will be held. I understand that Mr. Blair is going to give a keynote speech there also. On the evening of 27th, a reception was organized at British Embassy in Tokyo in which many members of parliament from England were also present. After that, I moved to Roppongi Hills to be a part of the panel with 100 young people and Mr. Miliband, Minister of Foreign Affairs. Mr. Miliband is a 42 years old, up-coming star who is expanding the public relation activities by posting information on his personal Blog. The panel was focused mainly on these topics, but unfortunately, the duration was too short i.e. just an hour. I would like more of various programs like this to be organized. You can view the sight of the panel in his Blog. I am now in Seattle, participating in Pacific Health Summit which is held annually in June since last 4 years. I have attended the first conference four years ago, but could not make it to the 2nd and 3rd conference due to some other schedule. This year’s theme was "Nutrition" and I participated in a panel on "Soaring Food Prices, MDG (Millennium Development Goals)." The host was Peter Singer from Toronto University, one of my old friends. The problem of nutrition and food is a global challenge. As the FAO conference held in Rome 2 weeks ago was not so successful, it may not be easy, but the topic is expected to be in the agenda of Toyako Summit to be held in July. 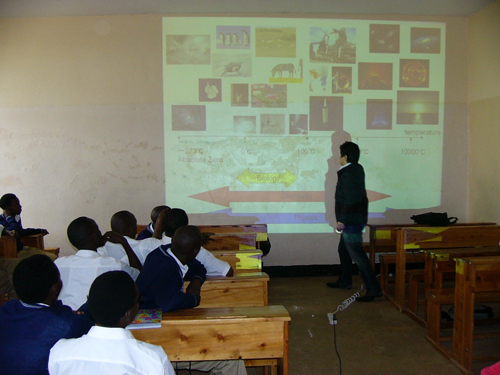 Recently, I am immersed in TICAD as well as G8 Summit, greenhouse, energy, poverty, development and issues in Africa, etc. It’s nice, I see same people (refer 1 and 2 ) on one hand and also get acquainted with new people on the other hand. The world is "flat" now and issues have become global. I feel that challenges that Japan and each one of us will face in the future will be very big. I also met Dr. Margeret Chan, Director General of WHO whom I haven’t seen since last year. She is also exercising great leadership skills. Seattle is a very beautiful city with beautiful waterfronts and woods. The weather was fine and I enjoyed my stay very much. 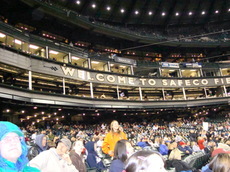 I even went to see the game of Mariners using my free time. This year their condition was not so good. 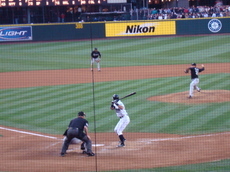 Audience was small (almost 1/4th of the capacity of stadium), and Ichiro had 2 strikeouts. It was a boring match since the team lacked the "winning" spirit. But applause for Ichiro was greatest in his home ground and I think he will appear in the "All Star Game" this year too (last year he was the MVP). What a pity that Jojima was not a part of starting member! As expected, the replacement of the manager was announced on the next day. On June 15th, Science and Technology Ministers’ meeting was held for the first time in G8 summit history, in Okinawa. 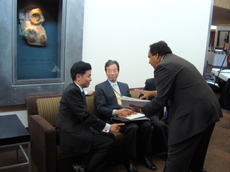 The host was Minister, Mr. Kishida. The informal G8+5 Science Advisors’ Conference was held on June 13th and 14th and the main topic was "Brain Circulation." This is the extended version of Erasmus program of EU. There is awareness that for the challenges of coming global era, it is necessary to develop mutual understanding between the young people who are the pillars of the country’s future. Everyone is aware that short-term mutual exchange program of 1 year or so is necessary in the universities, graduate schools or at even younger ages. This is especially an important issue for Japan. I have repeatedly mentioned in the blog, that I think the biggest problem is that Universities in Japan are isolated even in this era, and young people are not aiming for overseas opportunities. Also the number of Japanese student studying abroad is decreasing. On 14th, after a presentation related to clean energy by Dr. Steveｎ Chu from The Okinawa Institute of Science and Technology (OIST) in the evening, there was a reception ceremony by Mr. Nakaima, a governor of Okinawa, and arrival of Minister Mr. Kishida. After finishing TICAD in Yokohama, I left Narita on June 3rd in the afternoon and came to Cape Town near Cape of Good Hope at the southernmost Africa via Singapore to attend the Africa Conference on World Economic Forum. The conference is being held here annually for the past 17 years and this is the 18th conference, which is quite an achievement. Dr. Sadako Ogata, the president of JICA, who is also one of the leading persons in the promotion of TICAD, is the co-president of this conference. She was very active during these three days, attending a number of panels every day. I truly appreciate her effort. Approximately 10 companies from Japanese business sector such as Tokyo Electron (chief executive, Mr. Sato), Hitachi, Mitsubishi Corporation, Sojitz etc, have participated. His Excellency Odano, the ambassador of TICAD also participated which had a very good effect of impressing the presence of Japan. No growth is possible in anything without the involvement of business. Number of conflicts taking place in entire Africa are reduced and the rate of economic growth is 5-6%. This is a place of good business opportunities. Japanese businesses should also get a grip. I also participated in 2 panels, and talked especially about achievements of TICAD and expectations to G8, MDG, from the viewpoint of energy, food crisis, and development. 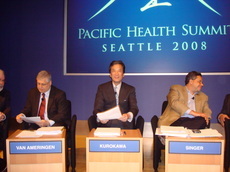 Photo 3　From the left side Dr.Tsuchiya from WEF, Dr. Kurokawa of JICA and Dr. Kondo of Health Policy Institute, Japan. Many attendants from Africa including Mr. Mbeki, the President of South Africa Federation, also participated in TICAD, so the presence of Japan here was strong which was great. But above all, it was the presence of Dr.Ogata. She is known and respected by everybody here as elsewhere and her comments always make a very good point. She is really the "Pride of Japan." In the afternoon of the 2nd day, I left the conference, as the weather was too good and came down to Cape of Good Hope. It was like California, since there were many places just like Santa Monica and Malibu. 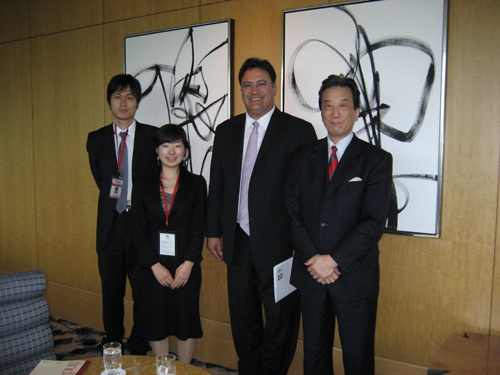 Photo 5　Cape of Good Hope, from the left Mr.Okada and Mr.Hacchoji from Hitachi. I went to Abu Dhabi via Dubai after finishing the 3 days conference. Visited His Excellency Ambassador Hatano, discussed with the government officials related to university and the person in charge of health policy etc., thus spending 20 hours, I finally started my return journey. On June 8th, I arrived in Japan in the evening. A large number of achievements were released from Japan at TICAD4, held in Yokohama, I can say. Having heads from 40 countries in Africa to the conference, the Prime Minister Fukuda met and talked personally with them almost every day. In addition, he talked with Dr. Bono as well as Dr. Jeffrey Sachs, UN Secretary-general Adviser. Japanese Government certainly worked hard and did a good job. I feel that the Prime Minister strengthened his recognition of the importance of the activities of NGO. I also attended the Hideyo Noguchi Africa Prize ceremony and lectures of the prizewinners at the United Nations University on the next day, participated in the panel of "Action Wave" organizer Mr. Koji Omi, with the President of Rwanda and Professor Juma of Harvard University. Since I had just received the photograph of a lecture by Mr. Ito Ken of Tokyo University in Rwanda, I was inspired to start this panel with his story. Here also, many Japanese young people are working hard. In the excellent project of "one day chief editor" of Asahi Newspaper, Dr. Bono edited the newspaper of May 31, and discussed various topics such as Africa and TICAD and it was sparklingly different from regular newspaper. In addition, he wrote about Africa support program budget of Japan that was announced at TICAD.